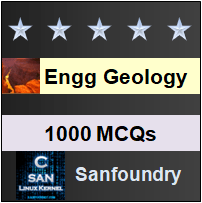 This set of Engineering Geology Multiple Choice Questions & Answers (MCQs) focuses on “Igneous Rocks”. Explanation: The branch of geology dealing with various aspects of rocks such as their formation, classification and occurrence is called petrology. 2. What are the two conditions believed to be required for the formation of igneous rocks? Explanation: A very high temperature and a molten state are, two very important conditions for the original material from which the igneous rocks are believed to have been formed. 3. What is the state of lava or magma? Explanation: Magma or lava from which igneous rocks are formed may not be entirely a pure melt: it may have a crystalline or solid fraction and also a gaseous fraction thoroughly mixed with it. 4. Where are the volcanic rocks formed? Explanation: Volcanic rocks are the igneous rocks formed on the surface of the Earth by cooling and crystallization of lava erupted from volcanoes. 5. What is the grain size of volcanic rocks? Explanation: Since the lava cools down at very fast rate (compared to magma), the grain size of the crystals formed in the volcanic rocks is very fine, often microscope. 6. Magma is hypothetical melt. State true or false. Explanation: Igneous rocks are formed both from magma and lava. It may be mentioned that magma is actually a hypothetical melt. It has not been possible to see it at its place of occurrence. Explanation: Plutonic rocks are the igneous rocks formed at considerable depths, generally between 7-10 km below the surface of the earth. Explanation: Because of a very slow rate of cooling at the depths, the rocks resulting from magma are coarse grained. These rocks get exposed on the surface of the earth as a consequence of erosion of the overlying strata. 9. Pick the plutonic igneous rock. Explanation: Granites, Syenites and Gabbros are a few examples of Plutonic rocks. They occur in good abundance in both the Peninsular and extra-Peninsular India. Explanation: The hypabyssal rocks are the igneous rocks which are formed at intermediate depths, generally up to 2 km below the surface of the earth and exhibit mixed characteristics of volcanic and plutonic rocks. 11. Porphyries are examples of which type of rocks? Explanation: Porphyries of various composition are examples of hypabyssal rocks. 12. Which is the most dominant constituent of igneous rock? Explanation: In terms of chemical composition, Silica is the dominant constituent of the igneous rocks. Second comes the Alumina. Explanation: In terms of the mineralogical composition, Felspars are the most common minerals of igneous rocks. Even amphiboles, pyroxenes and quartz are present to some extent. Others are present only in subordinate amounts. 14. What is the approximate percentage of silica present in the igneous rocks? Explanation: The approximate percent of silica present in the igneous rocks is 59% and alumina is about 15%. This was given by the data of Clark and Washington.